Whenever I can grow or find fresh cabbage locally we will have a batch of sauerkraut or kimchi fermenting on the counter or ready and waiting in the fridge. Since fermented foods are so healthy and great at boosting nutrient absorption from food, we include a serving of it at every meal, including breakfast. When I mention this to people they kind of look at me sideways. 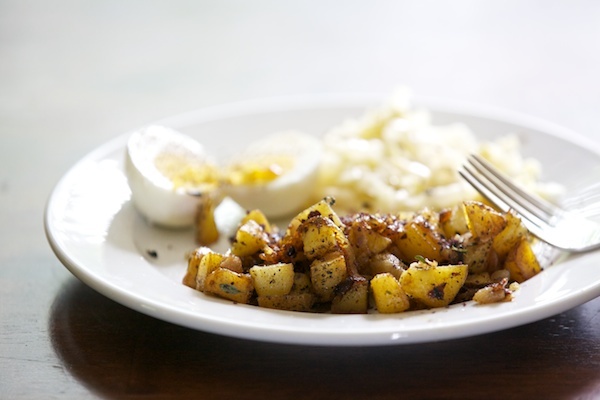 Not many people think of including sauerkraut for breakfast. I can’t think of a better way to start you day off the right way than with some fermented goodness. Growing up, I always hated sauerkraut, but then my grandma always served the stuff that came in bags. As with most foods, the difference between what you buy at the grocery store and the freshly made from scratch version is like night and day. If you’ve never had homemade kraut teeming with probiotics, make up a batch, you’ll be amazed. 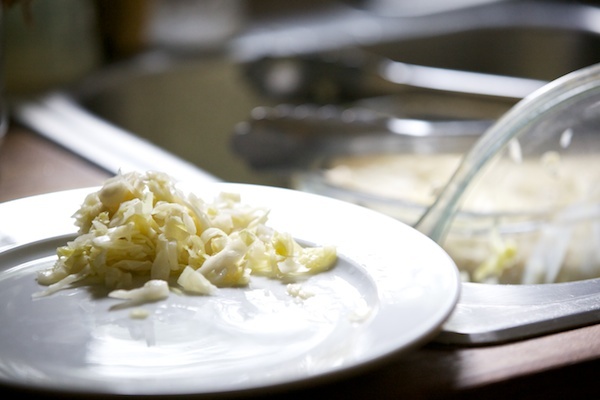 You can find my recipe for Making Sauerkraut here, along with this post on How to Tell if you Sauerkraut is Finished. Sauerkraut is considered a SUPERFOOD. What does that mean? We’ve all heard about the health benefit of cruciferous vegetables, it’s ability to fight cancer, provide tons of vitamins, antioxidants and other goodness. When cabbage is fermented into sauerkraut or kimchi, it unlocks all of these nutrients making them more available to our bodies. In addition to increasing the availability of these antioxidants, fermentation adds probiotics to the mix. 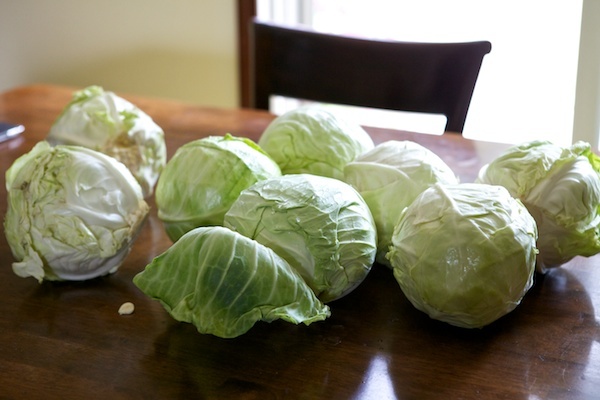 These probiotics allow our bodies to absorb even more of the healthy goodness from the cabbage. Probiotics also boost your immune system by increasing your body’s ability to fight off baddies like e-coli, salmonella, and candida. I won’t reinvent the wheel here by going into all the health benefits of sauerkraut, for more reading see the links below. I’ve also been reading recently about how probiotics and fermented foods help curb sugar and carb cravings! There’s nothing quite like starting your day off on the right foot. We always eat a big healthy breakfast here at Chiot’s Run that includes healthy pastured eggs, vegetables, fermented foods and raw milk. It makes a huge difference in our energy level and allows us to accomplish much more each day. Do you incorporate any fermented foods in your diet? Which are you favorites? 4 Responses to Kraut – For Breakfast? I have been on a pickling/fermentation streak lately, so you don’t have to ask me twice to eat something fermented :). Kraut is one of my favorites, but I also love pickled lettuce, pickled cherry tomatoes. I pickled all of my summer squash surplus from the garden. One of my most favorite pickled items from Ukraine (my homeland) were pickled sour apples – they were the best. I am still looking for small apples similar in crunch and tartness here in the States, to brine them. And, naturally, I ferment the milk and make kefir and farmer cheese. love your blog though my diet is very different from yours. So many people know nothing about the health benefits of fermented food. I think it’s a skill we should all learn. Fermented foods can be incorporated into any diet. Always learn so much here and if not have what I do know validated. Oh and I occasionally eat sauerkraut for breakfast as well along with greens which some think it just weird. Not much to be honest… I was making and drinking kefir daily but I stopped and have my first gallon of kombucha ready. I’ve been planning slowly but surely adding more slowly but surely. Your breakfast looks great! I love kraut but dont eat it often enough. Yes! I had two pastured eggs, fried in pastured bacon fat over kimchi this morning. I’ll be making up another batch of saurkraut soon and I’m thinking of trying a batch of cortido too. I haven’t been having much luck with my sweeter ferments lately, they’ve all been going straight to moldy. I’m thinking that airlocks might help. I don’t seem to need them with the saltier ferments. So nice to have your blog for inspiration, and connection to like-minded folks!